Cat Chat With Caren And Cody: Pet Blog Challenge, Better Late Than Never!! Pet Blog Challenge, Better Late Than Never!! Yeah, Yeah I'm waaay late. Cut me some slack, I didn't find out about this til later, then I was trying to decide whether or not I was going to be a late participant and yep I have decided to be! I started blogging October of 2009. At that time I was lucky if I blogged once a month. I didn't start blogging regularly til approximately April of 2010. I had lost my job in 2007 due to downsizing. I was feeling worthless, depressed, not at all like me. I had worked my entire life and I knew I needed a "purpose". Cody in the "original" Cat Chat Chair! I saw an ad and attended a workshop that The Oakland Press (a local S.E. Michigan newspaper who "houses" my blog) sponsored for individuals who wanted to become "Citizen Journalists". I was offered (and turned down) the opportunity of covering City Council meetings (boring, boring, boring). I knew that WASN'T for me! I knew the online world was booming and I noticed they had a number of blogs on their website but NONE about Cats. I wanted to write about something that I was passionate about and writing about cats was the no-brainer choice. "Cat Chat" was one of the blogs I suggested, I also suggested a food blog and a Reality TV blog but they chose "Cat Chat!". I had never done a blog before and actually was terrified at first. 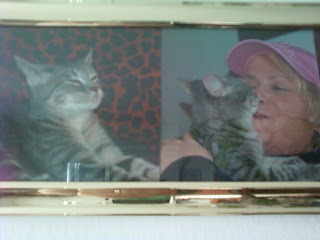 I dedicated "Cat Chat" to my Angel Bobo and my Cody..... and ran with it! I would say overall yes. I am a very passionate person who has tried throughout her life to ONLY be involved with people and things that I am passionate about. If you don't believe in your gut and don't have a passion for what you are doing it will never work. The day I stop being passionate about cats (which will NEVER happen) or lose my passion for my blog is the day I need to give it up. As I mentioned when I started the blog I was lucky if I was doing one blog a month. In April I started blogging on Mondays, Wednesdays and Fridays. That is the basic schedule I try to adhere too. This past Fall/Winter I was blogging nearly every day. For me I think that is a little too much. I know how hard it is for me to keep up with blogs that post nearly every day and I don't want my blog to become a bother for someone to read. Don't get me wrong, if I have something to say or to post then by all means I will. Otherwise blogging on Mondays, Wednesdays and Fridays are what I shoot for. I am lucky, yes....a little bit!! Not enough to pay the bills by any means but I am lucky to be making any money at all. I would love to earn more money with the blog but if that doesn't happen I am ok with that too. Ultimately my blog is for my regular readers (who I value more than anything) and to convey my love of cats. If extra money happens fine...if it doesn't I am fine with that too. I think what I like the most is the incredible people I have met along the way. It is amazing how close I feel to so many of the bloggers after not having been blogging that long. Pet Bloggers are a generous, warm, caring and supportive community that I am honored and proud to be a part of. 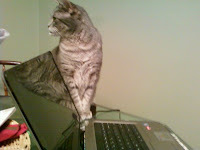 My favorite times on my blog are when I am blogging as my cat, Cody. I love the reactions I get from my readers when I am Cody. Cody has an attitude, he is sarcastic, fat and sassy but fun and loving....hmmmm...an awful lot like his Mom! I have ALWAYS loved to make people laugh. That is a characteristic I have had since childhood and speaking as Cody truly is a vehicle for me to be able to make people laugh. There is no better gift to me than when I experience a good laugh and I want to be able to give the same gift of laughter to others. I love doing book reviews and am trying to get my paws ooops hands!! (Cody slipped in! Sorry!) on product reviews. I think that would be a ton of fun! I love supporting various causes pertaining to cats/rescue/neutering etc and I love the kind people who have been featured as Guest Bloggers. I also love constantly learning and trying to improve my blog. I have a long way to go, it is a work in progress. The fear of having nothing to say (Writer's Block). The constant fear that I am just not good enough! But I keep plugging away! I don't like to try and predict too much because life/God has a way of leading us where we are supposed to be but I would like to finally become adept at using my video camera and shoot videos. I want to become much more technologically savvy than I am now. I have a digital camera and NEVER use it and I know I need to! I want to work even harder than I have thus far because I am one that believes with hard work, passion and a belief that you CAN DO IT...the sky's the limit!!! Thanks for taking the time to read and sorry I am so late! Thanks to all of the bloggers out there who touch my heart both through your comments on my blog and through your posts on your OWN blogs, who make ME laugh and learn and ponder on a regular basis....you guys rock and you are my idols! How fun! I sure didn't expect this today, but it was very good. Thanks for sharing. Was good to get to know you a bit better! Always enjoy learning more about fellow bloggers. It's fun to see how and why others started blogging. Enjoy your blog and look forward to the coming year with you. Oh yaay, that was nice to read. You have done a lot in a short time here! sorry for being so delinquent in dropping by. I love your blog thingy and will be checking it regularly. Thank you Caren to did this challenge because it's simple way to get to know you more. My mom thought she want to this too and then she forgot ! because you gave inspiration to her " Better Late Than Never!! " 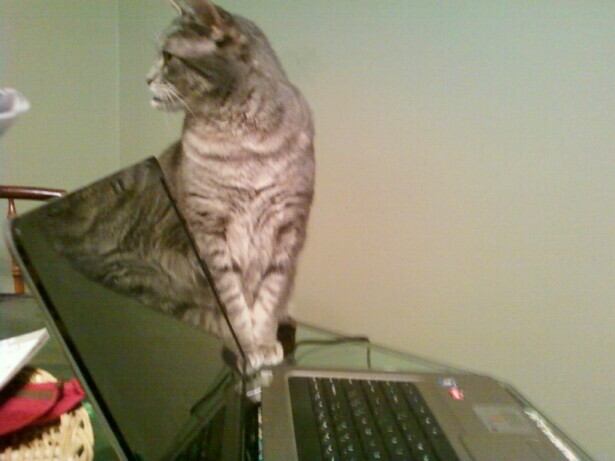 She think we all cat blogs should do it ! because it's really interesting to get to know all cat's mommy !!! Wow - great blog. We can really relate to a lot of it, especially the fears part. You have nothing to worry about! Keep the good work, Caren and Cody!!! We love to hear from you. I don't think you have to ever worry about writers block Caren. You always havesomething interesting on your page. Which is why I think you were the first page I followed. Love you! Very interesting, Caren ! "Writer's block"... "the anxiety of the blank page" (l'angoisse de la page blanche), we say in French. Zeb (the cat) says he does not know it, but I do ! In fact it is not so much that I find nothing to say but I have no time to blog on my three blogs : one for the kitchen, one for edible wild plants, one for ... cats, my favorite even though he has virtually no audience. Working at home, I think I spend too much time blogging, it is not reasonable. But, as you say, over the blog, virtual friendships are tied, we play the game .. It's terribly human, after all ! Have au nice day Cody and you ! That was great and we all enjoyed reading about you and your bloggie! 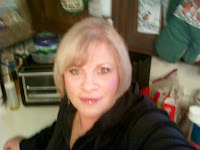 Caren, what an interesting post about your blog. I feel fortunate to have found your blog; it feeds my passion and love of animals (especially cats). @Art and Sew Forth...uh-oh!! I didn't expect it either!! lol. I was up around 11:30pm and wasn't going to blog at all today. I was catching up with the blogs I read and saw yet another blogger who participated in "The Challenge" and I kept feeling guilty that I hadn't so I jumped on the bus! Glad you enjoyed it though! @Brian thanks for taking the time to read it! @Colibri, you hit the nail on the head. You covered EXACTLY how I feel! You have THREE blogs? How in the world to you ever manage to keep up with all of them?? You are right about it being time consuming. I am literally on the computer from the early morning hours (around 6 or 6:30am) and am often online til after midnight....with a few hours away from the computer during the day. I am amazed at how this has taken over my life!! Thanks so much for your insightful words! @AlittleSprite I am soooo glad you are BACK and safe and sound!! Will be over to your blog to see how things are. You really flattered me when you said my blog was the FIRST one that you followed and I deeply THANK YOU for that!!!! Do you know I am trying to remember who the first blog was that I followed and I am embarrassed to say I don't think I remember! I THANK YOU from the bottom of my heart for choosing mine! @Priscilla THANK YOU!! You are waaaay too kind! I showed Cody what you wrote and he is so happy! He thinks he should be writing the blog more so we will see what we can do about giving him some more time! Thanks for your continued support/caring/friendship...you know you mean the WORLD to me! @Fisher and Staff, your comment really touched me and I thank you!! I appreciate that you can related about the "fears part" (but YOU have nothing to be fearful about at all!) I think part of why I am so compelled to leave comments on others' blogs is because we all love feeling validated and we all love to see thoughts on our posts so I like to offer others the same validation you have just so kindly given to me! :) Thank you! @Mr Puddy lol! I am like your Mom where I FORGET A LOT TOO!! lol. I was also partly lazy because I know when I DO talk I talk waaaay too long and I knew it would take me a long time to write so I kept hesitating. I am glad you enjoyed it and tell your Mom she can still do it even if it is late! @cujo cat thank you!! You are soooo funny! Did you know that Bobo is a BOY and he crossed the Rainbow Bridge! lol. But I bet he would still like a girlfriend! Thank you so much for reading and visiting and am thrilled to have you! @Dr V "I am not worthy!!!" lol!! (Bowing to one of the BEST!! )....thank you!! I am flattered, thank you! You KNOW I read your blog regularly...I don't always leave comments but I am a daily reader "lurking" when I'm not always commenting!! Thank you!! @Mason thank you! I am thrilled to have met you late in 2010 and am looking forward to sharing many more great times reading your blog as well! Thanks for your kind words! Thanks all for taking the time to read this rather long interview...it means A LOT!! Thanks for sharing Caren. It's nice to know more about you. You have a way with words so I don't think you will ever have to worry about writers' block. So nice to read more about you, Caren. You have accomplished a lot in a short time. Thanks for the inspiration from this newbie! @Cherie you are welcome and I thank you!! You really made my day!! You have a great day as well and I am so happy to have met you! Awwww thanks for sharing a little about yourself here Caren Gittleman!! Me and Charlie are so plesed to meet you and gorgeous Cody!!! It'd be great if you did product reviews as I really enjoy your book reviews!! I always say, the moment blogging because stressful and a chore is when I'll pull the plug!! :-) I really think blogging should be a fun thing to do even if it's serious! Mom and I think it is so cool that you have managed to make some money blogging. Mom says that if someone wanted to pay her to blog that would be awesome. I think she was hinting at me though. It was very nice to get to know you better! We are so happy dat you did take up blogging cuz your information is always so helpful and educational - besides - I love Cody! Kitty kisses for you and "high paw" for Cody. @Mario you are one of the very FIRST people/cats that I met when I started blogging and that is just a small part of what makes you soooo special to me! You were ALWAYS warm, welcoming and encouraging (you didn't know it then but you WERE!) and you still are! Thanks so much! All of you make it so much fun for me! You know I LOVE your blog as well! ((((hugs)))) and kisses to you and "M"! @Erika and Blair thanks so much! It is and it is much appreciated. I didn't make anything for the first 6 mos and I still would have continued even if I didn't. What I make is very, very small in comparison to the time that is expended (as YOU and ALL of the other bloggers know) but yes I am lucky to make even SOMETHING and I am grateful for that. We're glad you're blogging! And you're right - the CB community is a very warm, caring place. Caren, I enjoyed reading your interview. I love reading about fellow bloggers and what brought them to this wonderful blog world. I loved how Cody inserted his "voice" in your writing. BTW, thanks for the good thoughts. OMG! I didn't realise that blogging could be so structured and errrr organised! As others have said it's great to get to know more about you, Caren. You are most definitely a force of nature. I think Cody and Dakota are very blessed to have you. Keep it up! Love it, Caren. I am also a very passionate person and don't believe in doing anything I feel "blah" about. I also tossed around applying for a reporter for council meetings and thought the same as you: BORING! @Shawn with all you have going on I am extremely flattered and touched that you stopped over and I THANK YOU for your kind words and support! (((((hugs))))) Hope all went well! Thank you! I am blessed to have Cody and Dakota and I am THRILLED that you started blogging due to boredom or whatever because if you hadn't I might not have met you! I thoroughly enjoy you! @Coupon Queen and Mickey I THANK YOU BOTH sooo much! I also don't always have time to comment but I am usually lurking/reading somewhere too! I follow both of you! Thanks a million! Oh and Coupon Queen, Dakota is FINALLY going to the vet tomorrow. Much to his dismay! So that's your secret to having such great, well-written blog posts at all times....writing only 3 days a week....now that's a great idea! I too started blogging because I wanted to rediscover my passion for writing and since I am passionate about our 3 pets (Henry, Buster, & Daisy) and about my pet sitting business I decided to combine the two and blog! I am glad you found your purpose through blogging....I love reading your posts! By the way, thanks for liking my pink boots but they are actually slippers that I bought on sale at Old Navy and if you look closely you'll see that they are mismatched (Daisy ate the pompoms off one slipper...grrrr! Great chat! Thanks for visiting my blog. @Angie ohhhh I know you are BEYOND PASSIONATE!!! That is one of the MANY things that I LOVE about you!! I can feel your passion for cats in everything that you do!! You and I covering City Council? Can you imagine??? lol. You would be envisioning them all as being cats...and I would be making sarcastic comments! Our paths WERE destined to cross and THANK YOU for your ongoing support/friendship! Love you my friend! @The Teacher's Pets...LOL!! Actually this week I have posted nearly every day!!! Grrr!! For me that is overkill! All through Oct, Nov, Dec and part of January I have posted more than 3 days per week (the 3 days a week is a MINIMUM)...if things come up then I do extra ones. I also believe in having Guest Bloggers to lend a different "voice" and to give me a break! I am blessed to have had (and have) some wonderful people who are willing to guest blog. You have a pet sitting business AND a blog! You are beyond busy! I was just at Old Navy at Christmas time and should have seen those slippers but missed them! You are also super passionate which I love! What a great post! We love your blog and are so glad that we found you! @Oskar & Pam...thanks!! Yeah I BET you are! lol. Glad I could help! Maybe it's not nice to say it; but thank God you lost your job! Otherwise this blog might never have existed (mine happened quite the same way!!). It's full of warmth, heart and passion/compassion and it keeps a warming fire going. I LOVE your blog and the sentiment of it all. @GlamKitty...awwww that was the sweetest thing EVER!!!! Thank you sooo much for your extremely kind words! It means A LOT!! Cody was a little kitten in that picture and I love that one too!! @Boom that was so sweet of you to comment too! Cody and I send our love to you both! @Amanda thank you!!!! I am flattered!! Isn't it nice to get work that you love??? @Au and Target...I have to say....YES!! @God's Little People, it is so strange that you said that because I was thinking that when I wrote this. Had I still been in my previous job I probably wouldn't have started a blog. I do truly believe everything happens for a reason. @Abigail, Madison, Lisa...Yay!! so nice to have you all stopping by! You are welcome! I really love your blog and your videos are sooo informative, cute and lively!! I love your enthusiasm! Thank you soooo much! You made my day, your words really mean a lot! oxoxoxoxo back at all of you! @Benny and Lily....and I think that the translation of that comment means "Ok enough already, now STOP!!!! MOL!!" We're glad you decided to be late as opposed to never! We enjoyed learning about your blog and we enjoy visiting here since we...do we say found you or met you? mol! @Cara n Crew thank you!! I think "found" or "met" both work for me! I am happy to have "met"/"found" you as well!! ((((hugs))) to all of you! How cool to learn more about you and the blog! @Catsparella, don't feel bad! You are sooo busy I don't know how you get around to all of us to begin with! I appreciate you stopping by! So glad you liked this! Your kind words really touched me and I thank you!! @The Vet Girl thanks so much and I am thrilled that you enjoyed it! I am so glad that you decided to blog... I look forward to reading every day... Also, I love when Cody writes too! @Hilary awww thank you!!! If I hadn't I wouldn't have met YOU so I am glad that I did! Cody says thank you as well! Big hugs to Alex! That was fun. We wanted to let you know we lost our blog and have set up a temp one. Come by and visit. @Cats of Wildcat Woods, thank you! OMG! How did you lose your blog? I am gonna come right over! xoxo Thanks for letting me know! This was wonderful to read!!! We have a lot in common! I think I might do the Mon, Weds, Fri thing like you cause I think I overkill it when it's 5 days a week. I felt a lot of pressure suddenly with the whole Blog of Note thing. I felt I had to become super blogger when I don't always have time to be..hehe I notice the comments go down a fair bit too when you do it daily..hahaha..don't blame them. there is only so much time in a day. i find it's hard sometimes to visit all the lovely blogs. btw your comment cracked me up hard. Wishing you a great weekend..I'm working right now so will have to come back to catch up on your posts. love your blog! you are a great writer! something i struggle with sometimes, so i subsitute with pics..hehe. @Kitty Stampede...awww thank you! You are so sweet! Well, I strive for the 3 days per week but as I said since Oct it has been more like 5 or 6 days a week and it is just TOO MUCH. I know the "master blog" websites would disagree w/me but I agree that it is overkill when I do more. I do it when I have something to say but it is so hard for people like myself (even not working full time) to be able to read the blogs that post every day. Frankly it makes me incredibly nervous to keep up with them! I love the blogs that I follow but it just gets to be waaay too much! You know what? I agree about comments going down with daily posts. The other thing is I notice on the blogs I have with photos I get more response than the ones I pour my heart into writing! lol. People want a "quick hit" and leave...they don't want to stay and linger. I do the same about substituting with pics!! Trust me! You are sooo kind! I am not grammatically correct much of the time (which I hate) but my spelling is usually right on the mark because misspelled words are a HUGE pet peeve of mine! So glad to meet you and thanks for your support! I loved reading more about you and your blogging background. Like you, I, too, think that one of the best things about blogging are the wonderful people we meet as part of the blogging community. Really enjoyed learning more about you and your blog - I'm glad you decided to participate!